Our Softball Club seeks to instill in the girls: ideals of good sportsmanship, honesty, loyalty, courage, and respect for and of authority so they may be finer, stronger, and happier girls who will grow to be good clean healthy adults. This objective will be reached by providing supervised competitive athletic games. The supervisors, coaches, parents, volunteers and spectators shall bear in mind at all times that the attainment of exceptional athletic skill or the winning of games is secondary and that the molding of future citizens is of prime importance. For registration and information please visit www.scsoftballclub.org. The Ed Davis Summer Basketball League is a training and development league for young girls and boys. It is a program co-sponsored by Georgetown-Scott County Parks & Recreation and Ed Davis Community Inc. The basketball league is intended for girls and boys ages 5 – 11. The Ed Davis Summer Cheerleading is designed to support the Ed Davis Summer Basketball League during games. It is a program co-sponsored by Georgetown-Scott County Parks & Recreation and Ed Davis Community Inc. The basketball league is intended for girls ages 5 – 12. Over 600 youth between the ages of 4 – 16 participated in the youth soccer program. This soccer program offers two playing seasons: Spring and Fall. It is conducted by the Georgetown Football Club and the Parks and Recreation Department. Please download English or Spanish version of Registration form. For more information visit georgetownfcky.kysoccerlive.net/home.php. The Georgetown Force Volleyball Club provides an encouraging environment for young women between the ages of 10 and 18 to develop their volleyball skills, to exercise sportsmanship, and to enjoy the game of volleyball in our community. We have local, regional and national teams with total participation of approximately 200 young women that compete in Georgetown, Lexington, Louisville, Ohio and Tennessee. Georgetown Force has a higher goal for the development of youth volleyball in Georgetown Kentucky. In addition to developing skill with high level coaching, we focus on developing the player as a person, growing the player as a team mate, developing life skills and building confidence while having fun. Georgetown Force Volleyball Club is committed to having a positive impact on the lives of Central Kentucky’s youth. For registration and information please visit www.georgetownforce.com. The Georgetown Tennis Association is recognized by the United States Tennis Association (USTA) as a Community Tennis Association (CTA). GTA is a not-for-profit tennis specific organization that exists to utilize USTA and other effective programming to promote and develop the game of tennis in the community. The Georgetown Tennis Association was named “Community Tennis Association of the Year” in Kentucky by USTA KY in 2011. We are not just tennis I the community; but we are a community through tennis! For more information, visit www.georgetowntennis.org. The Girl’s Youth Volleyball Clinic is for ages 9 – 16. Please wear gym shoes and knee pads are optional. 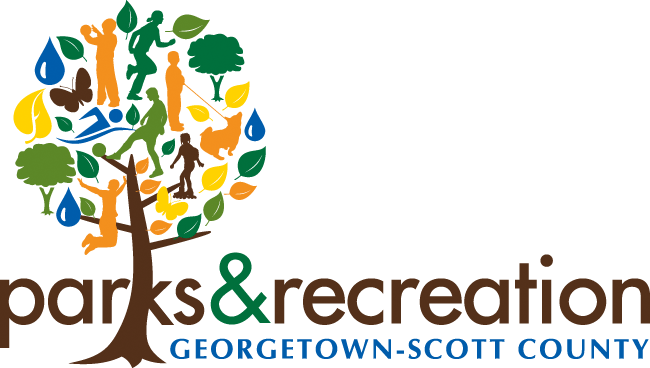 Georgetown Scott County Parks and Recreation offers classes at Brooking Park Concession Building and the Pavilion. Classes are scheduled on Monday, Tuesdays, and Thursdays, as well as Saturdays. Tuesdays and Thursday classes are offered year-round, with Saturday classes are offered at different times of the year. There are also specialty classes on Monday. Initially clothing for training either a karate uniform or for the first-class loose fitting clothing, including pants (no shorts). Also, please bring a suitable drink, preferably water. There are vending machines in the Pavilion, but students are expected to be able to get a drink without leaving class. Classes are scheduled on a four-week program. With the exception of specialty classes were drop-in classes, which can run 6 to 8 weeks. In addition to the ability to defend yourself, classes will consist of instruction in movement that will improve the speed, balance and focus of the participants. A premium is placed on that focus along with discipline, self-esteem, and respect for others. Introduction and continuing study in martial arts with an emphasis on effective self-defense will be taught by instructor Brad Wells, who has over 45 years, experience in the martial arts, with over 35 years of teaching. There will be an overview of Japanese, Okinawan, Korean and Chinese systems throughout the class. In addition to the ability to defend yourself classes will consist of instruction in movement that will improve the speed, balance and focus of the participants. A premium is placed on that focus along with discipline, self-esteem, and respect for others. Karate-Jutsu is the name of one of the first books published in Japan on the subject written by O’ Sensei Gichin Funakoshi. He was one of the first from Okinawa to teach Karate to the Japanese, and is widely considered the Father of Karate-Do. The curriculum used corresponds with the “Best Karate” series of books written by his Japanese student Master Masatoshi Nakayama of Shotokan, along with Okinawan teachings of O’ Sensei Shoshin Nagaminefounder of the Matsubayashi-Ryu style of Shorin-Ryu. Classes will be taught by instructor Brad Wells with assistant instructors from the program. Karate made fun for younger students. The class places of emphasis on age-appropriate behavior and the development of physical and social skills in a martial arts setting. Class will consist of martial arts movements that improve balance and focus of the participants. Instructor Brad Wells. This could be called a pre-karate program designed to be a fun and age-appropriate class, which takes into consideration the student’s younger age. Instructor Brad Wells. For students in Scott County Elementary Schools. Register at the Pavilion, Ed Davis Learning Center. For more information call (502) 863-7865. Registration is required and is limited to 25 participants, so act fast! For more information contact the Ed Davis Learning Center at (502) 867-5846. Scott County Youth Baseball provides the opportunity for kids between the ages of 5-15 to play organized baseball during our spring/summer and fall leagues. Signups for the spring/summer program are taken on a first come first serve basis due to limitations on field space. This year, beginning mid-January, signups for the spring/summer program will be on-line at the SCYB website www.scottcountyyouthbaseball.com. Youth football participants and spectators thoroughly enjoy the facilities of the Scott County Youth Football Complex which is located at Marshall Park. The program consists of four divisions: Junior Flag for ages 4 & 5, Senior Flag for ages 6 & 7, Junior Tackle for ages 8 & 9, Senior Tackle for ages 10 – 12. The league provides player jerseys and mouth pieces for all divisions. In addition helmets, shoulder pads, practice pants, and a seven-piece pad set are provided for the tackle divisions. All players are responsible for purchasing their own cleats and game pants. Please contact Parks Dept. for scholarship information. For detailed information and schedules visit www.scyfootball.com. Little Jammers Basketball Clinic is now Start Smart Basketball. Start Smart sports programs are a variety of sport national programs that were developed by top motor skill development specialists in the field of youth sports. Parent-child groups perform motor skill tasks that gradually build confidence in children while they are having fun at the same time. Participants will develop proper motor skills without the threat of competition or the fear of getting hurt that will allow them to enjoy and succeed in their youth sports future! For more information, call (502) 863-7865. The Georgetown – Scott County Super Sharks is a year round community based USA swim team. This is a competitive program that will stress individual progress, team work, and family participation. We seek to provide an opportunity for swimmers to reach their highest potential as both a person and a student athlete. Please email info@gscs.club or visit their website www.gscs.club, for more information.